For the Suspended Spaces project, Daniel Lê and Eric Valette decided to work together for the first time. They have come up with two autonomous videos which, for the occasion, are screened in the same space, a chamber containing two screens facing each other. The two videos are projected alternately on each of the screens. They were filmed in the same place in Cyprus, which partly explains their co-existence in the exhibition space: a Byzantine-style church under construction near a motorway and opposite a stadium, in the south of the island (Greek part). The unfinished church is made of rough concrete but nevertheless complies with a traditional Byzantine model. By comparing the social function of football and religion, and taking advantage of this strange proximity on either side of the motorway, Daniel Lê and Eric Valette thus propose two acoustic variations connected to the world of football in each of the videos. 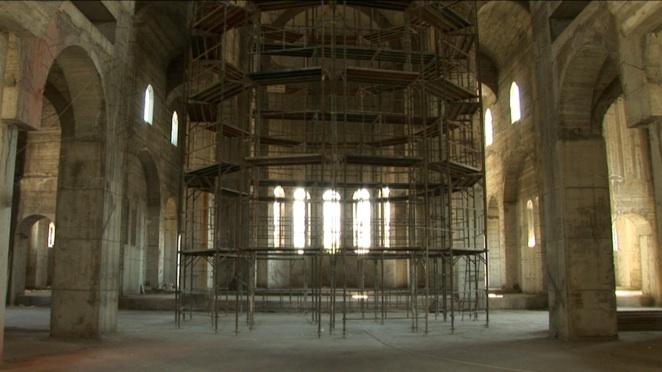 Derby, is a static shot video inside the church under construction: the nave, and various series of pillars and vertical windows punctuate the symmetrical space occupied in the middle by a large round scaffolding structure leading to the cupola, which is off-screen. Variations of lights and a soundtrack conceived like a score gradually enliven this image: movement is introduced into the building site in the form of at times coloured lines of light which glide over the pillars and the concrete surfaces. The sound of vehicles driving about is gradually smothered by the increasingly loud hubbub of a crowd of supporters in a stadium. This is the sound recorded during a football match: a derby, pitting the two Famagusta clubs in exile against each other— Anorthosis and Nea Salamis. The song heard, a lyrical poem paying homage to Amochostos (the Greek name for Famagusta), is sung turn by turn by the two stands of supporters, in a paroxysm of aggressiveness. Yelling, stamping, rowdiness, whistles, deep and powerful male voices, an enormous wave of sound in unison reacting probably to a goal being scored, little by little invade the empty nave which is nevertheless illuminated by the light outside and the headlights of vehicles passing on the motorway. 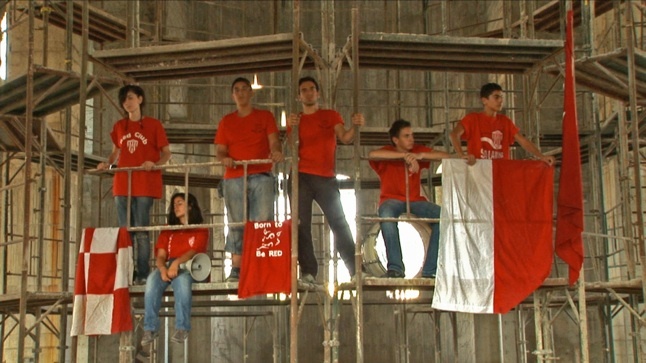 Born to be Red starts with a shot showing a motorway in the foreground and the empty stands of a football stadium in the background, through the wooden planks of a building site. A reverse zoom then situates the viewpoint from the outer porch of the building under construction, then the pivoting of the camera, followed by a tracking shot, before taking us into the nave of the concrete church. The noise of vehicles takes the place of the silence. Then voices can be heard while we discover teenagers wearing red T-shirts, positioned on the ground or on the scaffolding. Without much conviction, they start singing a supporter’s song. The camera winds up its movement with a vertical tracking shot which discovers the scaffolding leading to the cupola bathed in light. A few medium-range and close-up shots of the teenagers shows them, silent once again, either alone or in groups, wearing expressions caused by the incongruousness of the situation. Here, Daniel Lê and Eric Valette invited young supporters of the Nea Salamis club to sing in the choir of the unfinished church. 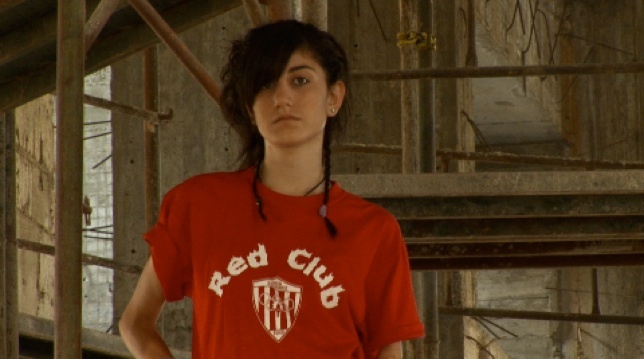 As a displaced human presence, the teenagers are in red, the colour of this Famagusta club—Famagusta being the ghost town that they have never known, but whose name they nevertheless champion, in exile. But red is also the colour of the Turkish flag: ubiquitous in the north part of Cyprus, and provocative to the point of covering a part of the mountain which rises up opposite the capital, Nicosia. “Born to be Red”, the “communist” slogan of the supporters of this particular club, thus rings out like a touching irony, from the teenagers whose town of birth is under the “red” jackboot of the Turkish army. The bodies of the teenagers, their silence and their awkward song, placed in the scaffolding, create a tension which refers to the difficulty of constructing oneself in the situation of separation which the island is in, but over and above this, of constructing oneself through religious and sporting apprenticeships regarded as a social and cultural introduction.